I started worrying about garbage and landfills after I got out of college. I hadn’t taken any classes about it and I hadn’t been to any environmental rallies. I just started putting my garbage to the curb once a week for the city of Portland to pick up. Being a neat and orderly citizen with a basic understanding of mathematical exponents and limits, my eyes opened to the notion that it wasn’t just me throwing out cardboard, cat litter, and carrot peels. The whole city of Portland was throwing stuff out at a phenomenal rate. I put a “Reduce, Reuse, Recycle” sticker on my Pontiac Fiero and began thinking of things I could do to live according to my own bumper sticker values. I knew I couldn’t save the whales, but I could try to control how much stuff I was consuming. I could even rescue a few things other people were throwing out. Having student loans and a low-paying job probably helped, too. After paying all my bills, there wasn’t much money left for setting up housekeeping. My mother gave me a few odd pots and pans and I picked up two mismatched Pyrex bowls at a yard sale. Love is a funny thing; we assume everyone loves the things we love. Thanks to the magic of the internet, I’ve found more than a few people who love Pyrex bowls. I don’t know if they collect these things out of love or out of bumper sticker recycling obligations. Either way, a few less beautiful and well-made things are being kept out of the waste stream. I’m spreading the Pyrex love this year, too, as part of the Moxie Recipe Contest. 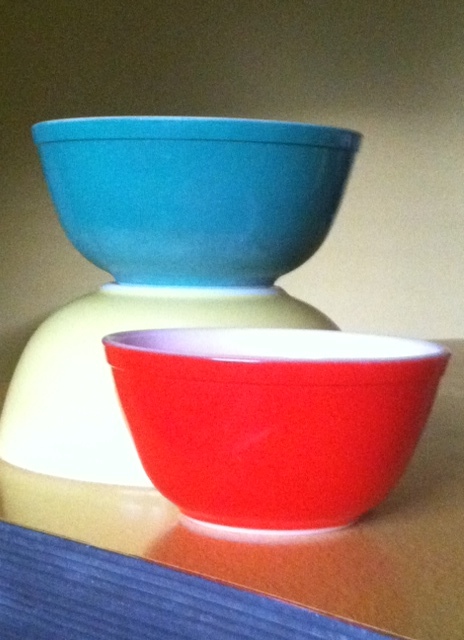 One of my sponsors, The White Dresser antique shop, donated this vintage set of Pyrex nesting bowls. I was pleased as Pyrex with Karen’s generous donation; I would be happy if you’d “like” her page on Facebook. And if you’re driving on Route 196 in Lisbon Falls, stop in and visit her shop full of pleasant, whimsical and practical things. The White Dresser is located at 501 Lisbon Road in Lisbon Falls, Maine. Spring hours are Thursday and Friday, 11:00 a.m. to 4:00 p.m. and Saturday, 11:00 a.m. to 2:00 p.m. This entry was posted in Abundance, You've Got Moxie! and tagged As good as new, Moxie Recipe Contest, Nesting bowls, Pyrex, recycling, The White Dresser. Bookmark the permalink. Funny to think of the old dump back home and how it had parts of it on fire all the time. Nasty. I’m glad times have changed. I became much more aware of recycling when I lived in Germany for the summer of ’83 and again in the early 90s where recycling is required by law. It just made sense. My relatives in the Netherlands were also recycling when I visited in the 70s and again in the 80s. When I lived on Schofield Barracks in Hawaii, there was a huge recycling program where bins were provided. I found the same program on Fort Carson in Colorado. Recycling is now second nature to me; I automatically flatten boxes and throw my plastics and cans in the bin. Wonderful recycling centers have sprung up all over the county which makes recycling very easy. I have also become a trash-to-treasure queen. I repaint old furniture and use odd and ends for my artistic endeavors. (This part drove my sons nuts. “Just throw it out, Mom,'” they would say.) I have found many uses for these odds and ends in my classroom, too. Don’t you find it interesting how many people collect Pyrex bowls? My mom still has some of hers, and I never thought of them as anything but pretty and useful items in the kitchen. I am astounded by how much they go for in the shops. Great blog as usual. Thanks! Thanks for sharing your insights and experiences. I remember the dump too and I swear I can smell it every once in a while in my memory. Apparently, it was a good place for target practice! Yikes! One of the greatest things I have learned in this “recycling” journey is to just stop consuming. That is the one lesson many don’t want to hear because so much of our validation revolves around consumption of “stuff” as a reward. I hope you’re working some of that into your lesson plans!